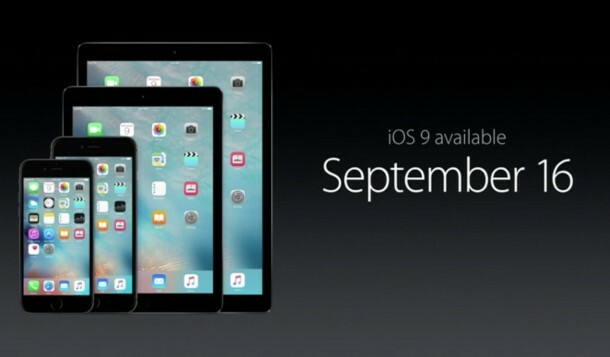 Apple has released the GM build of iOS 9, alongside the first beta of iOS 9.1. GM stands for Golden Master and represents the final build in a beta software production cycle, matching the final version that has been released to the general public as a download on September 16.
iOS 9 GM arrives as build 13A340, while iOS 9.1 beta 1 arrives as build 13B5110e, both are available now as IPSW downloads though the iOS Developer Center for compatible iPhone, iPad, and iPod touch hardware. Additionally, public beta testers can get iOS 9.1 beta 1 through OTA directly on their devices. Users running prior versions of iOS 9 developer betas can also choose to update to iOS 9 GM through the Software Update mechanism on their device. Presumably the iOS 9 GM build all also be released as an OTA download for users participating in the iOS 9 Public Beta program. Yes, the iOS 9 GM build matches the final version of iOS 9 available now. IPSW for each device and version are found here, and on the developer center. 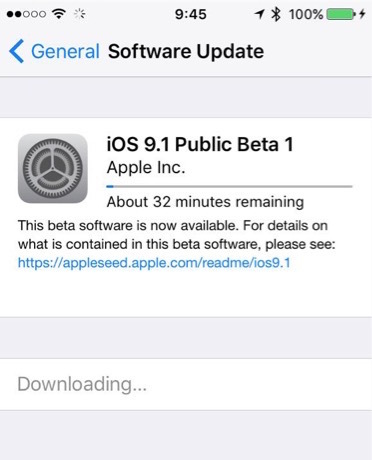 iPhone, iPad, and iPod touch users that are opted-in to participate in the iOS Public Beta also can install iOS 9.1 beta 1 right now through the Software Update mechanism on their devices through the Settings app. This allows users to skip iOS 9 GM and go directly to the iOS 9.1 beta if they’re interested. iOS 9.1 includes new emoji characters (like a middle finger) and likely other features, improvements, and bug fixes aimed at various devices. Some users are reporting that iOS 9.1 runs better on their hardware than existing iOS 9 GM build, indicating it may offer some performance benefits, though it’s wise to take anecdotal performance notes with a grain of salt. For developers interested in installing iOS 9.1 beta 1, they will need to update using IPSW for the time being. Subsequent iOS 9.1 betas are likely to be available through over-the-air downloads. It’s unclear what changes are included in iOS 9.1, though aside from feature refinements and bug fixes, it may also include features and elements that are aimed at the iPad Pro which is due for release later in the year. As mentioned, iOS 9 final will be available to all other users on September 16 as a free download for iPhone, iPad, and iPod touch. Additionally, WatchOS 2.0 will be available for Apple Watch users on the same day. iOS 9.1 does not have a known public release date, but given the first beta has just been released it will likely go through several revisions before being available to general users. Apple has also released OS X El Capitan GM as a download to Mac users testing the beta release on desktop and laptop computers. Your article says that iOS9 GM is build 13B5110e and 9.1 beta is 13A340. It’s actually the opposite. Look at the picture you posted at the top of the article. Personally, I would say run the beta, because iOS 9 GM feels a bit like a beta anyway. May as well get the middle finger Emoji! 2. login using your apple id. 4. now latest updates will be available to you …. download, install & enjoy. Same problem as Aidan. Current build on my iPad is 13A4325c. I have the first iOS9 public beta, and I’ve never received any update notifications. Even today, it says I’m up to date. I’m on the public beta program and went to my software update to see if I would get the GM for 9.0. To my surprise, I got an update for 9.1 beta 1. Very interesting considering that they just seeded and released the GM for 9.0.
iOS 9.1 beta 1 includes new emoji and Apple Pencil support, otherwise it does not seem to offer much else yet. I bet it will be out later October. Everyone should wait until September 16, but technically anyone can install the iOS 9 GM build right now with the IPSW files. Option+Click “Update” in iTunes and select the iOS 9 IPSW file and it will update. Really though, wait a week. At the very least backup, it could brick your phone. the one given is for 6plus…can pls provide link for iPhone 6 GM IPSW? I am using ios 9 beta 3 version on my iphone 6. Today i got a message to update the same 9.1 beta. So my question is if i go ahead and update my phone to 9.1, would i have to downgrade it to ios 9 complete version when it will be available in the mid september. Quite confused .kindly revert. i have to restore my iphone? GM – gold master not golden. From wsy back in the 20th century when software was released on CD-ROM. The final distribution ready software was laser etched on gold plated “masters” which were used to produce the CD’s for distribution. When software was physically distributed the production of the physical media was costly and difficult yo modify so producing the gold master was a huge commitment. There were no downloadable bug fixes. The good old days, back when software was less buggy because they couldn’t release quick patches! But software is better now, it just has more bugs… what a trade off, right? Same question as Nick. If I update now to 9.1, will I be able to update to the final version of iOS 9.0 on the 16th? You’d have to downgrade to iOS 9 using IPSW and a clean install, backups from later versions of iOS can’t be restored to earlier versions (iOS 9.1 to iOS 9, for example). iOS 9.1 has more features than iOS 9, and I hear it runs better too. Beta or not, who knows? its possibile to downgrade iOS 9.1 public beta 1 to iOS 8.4.1? Yes for now, but once iOS 9 is released Apple will stop signing iOS 8.4.1 quickly and you’ll lose the ability to downgrade from iOS 9.1 to iOS 8.4.1 in that situation. Early this morning my ipad2 indicated that 9.1 beta was rady for downoad. I agreed and the download started until the unit closed and the apple showed on the screen. Things are the same and any attempt to restart/stop etc have no effect. I am in effect left with an ipad showing the apple and pinging now and then. What do I do to recover my ipad? Anyone seeming some quirky things happening with Bluetooth since 9.1? When I get an incomes get call and hit the connect button there is nothing there. iPhone screen says call is connected. If I pick a call up from the phone, then switch to the Bluetooth headset mid call, it’s fine–only seems to be when trying to accept incoming call. All other features (voice to text, listening to audio) functuining with Bluetooth just fine. I’m experiencing the same thing. I’m going to report it using the feedback app. I am experiencing the same thing with a Jabra Stealth headset. I just submitted on Feedback app. If I place or receive a call while connected, no audio or mic until I switch to iPhone or Speaker, then back to BT. Has anyone else experienced a problem with cellular data on some apps not keeping the state they are set to. I had a few apps with cellular data turned off when I first installed IOS 9, since then I haven’t been able to turn them back on. I was hoping 9.1 would fix it but it hasn’t. There is 2 places I found to try to turn them back on. Same problem with iOS 9.1 beta. No audio if I answer a call with my Bluetooth. Have to switch between iPhone back to Bluetooth so I can go on with the call. Bluetooth issue wasn’t fixed in beta 3 for me. I had to go back to 9.0.2, Is it still working good for you? I had same problem on iOS 9.1 beta 1, 2, and 3. Has anyone had this problem continue on to beta 4? I’m back on 9.0.2 and wanna go back to 9.1 but I use Bluetooth headset all the time. It’s not safe to have to pull out phone to switch Bluetooth while driving. Hi I’m on the 9.1 public beta. When iOS 9.1 officially releases or 9.1.2 for say, will I be able to upgrade Over The Air?